Whoops! Maybe you were looking for My Yu-Gi-Oh! collection? Yu-Gi-Oh! (often referred to as Fake Pokémon) is a popular Japanese short TV series written, produced and directed by Little Kuriboh. The series was created as a comedic alternative to the twenty minutes-per-episode anime currently on the market by compressing each episode into the space of two minutes. Little Kuriboh decided on this course rather than writing a full anime because he couldn't be arsed of industrial demands. For those of you who don't like pagan games like this, then you can always try the Christian spin-off series Yah-Weh-Oh!. Yu-Gi-Oh! Takes place in an idyllic fantasy world, where every disagreement and conflict is resolved by playing a children's card game. The series opens with an introduction to the main character Yugi Motou , a disabled child suffering from spontaneous ball-dropping syndrome resulting in odd shifts from deep to high-pitched voices. Yugi visits his grandfather, owner of the local card shop with an unhealthy habit of ending up in some form of trouble. 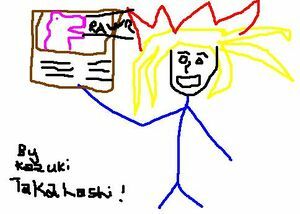 Here he shows Yugi his deck of cards containing the "super-rare-awesome-chocolately-fudgecoated-mega-super card", the Blue-eyes White Dragon, to which he is later mugged by an incredibly rich guy called Seto Kaiba who beats him at the child's card game resulting in Yugi's Grandfather to somehow require medical attention. Kaiba, now in possession of the Blue-eyes white tampon tears up the card after going through all the trouble of stealing it. Yugi suddenly enters puberty and settles the score by playing a game of cards which he wins so Kaibi runs off somewhere, and everyone flies off to some island to play some more card games or something, I dunno I got bored and decided to watch Top Gear. Yu-Gi-Oh! 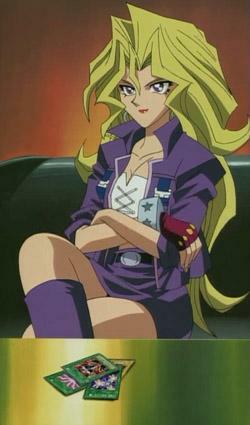 GX, is a spin off series set 10 years after the first series. It was not as popular as the first series, but ten times gayer. It follows the story of Jaden Yuki, a nerdy school boy ith no chance with chicks. So in order to make his life better, he decides to enroll in an elitist boarding school established by Seto Kaiba, known as the Duel Academy. The season was parodied many times by its original creator, LittleKuriboh. Kazuki Takahashi's attempt to copy Little Kuriboh's Yu-Gi-Oh Series. Following the success of LittleKuribo's short series, certain members of the anime community sort to destroy this new "short-anime" which sort to threaten the entire anime industry. One of these men was none other than serial plagiarist Kazuki Takahashi. Deciding he and his Nazi animators could not allow a revolution of short animations to take place, making the majority of their jobs redundant, he decided to recreate the entire series into a full length series with grueling twenty minute episodes. As Mr Takahashpipe had no experience in doing his own work, his own attempt at copying the series was a complete failure and was thus left with no other choice but to cut and paste from the original short series to make the full length show. This resulted in a repetitive anime (And thus indistinguishable from any other Anime) based on the theme of the show, playing a children's card game, giving rise to the Yu-Gi-Oh! Abridged seres. In May 2007 while Little Kuriboh was working on his first Yu-Gi-Oh film, he came across the abridged series on YouTube where he subsequently had Kazuki's arse "handed to him" in a year long war legal battle in which many giant robots and scantily clad school girls were raped and destroyed by tentacles. Kazuki Takamoustachi was forced to pay ¥23,000,000,000 (£24.65) in damages to Little Kuriboh, who went on to release his film, Yu-Gi-Oh the Movie in June 2007 with a thirty one minute run time. For those without comedic tastes, the so-called experts at Wikipedia have an article very remotely related to Yu-Gi-Oh!. Somebody made a wiki on this? Yu-Gi-Oh! is part of Uncyclopedia's series on Mass Media. This page was last edited on 8 September 2014, at 23:55.